For those looking to experience the local lifestyle, Vietnam has hill-tribes and rice farmers along the north mountain ranges. Mu Cang Chai is a typical example, below are specific and detailed instructions for you to easily make your trip to Mu Cang Chai. Mu Cang Chai Vietnam is one of the most amazing landscapes of rice-terraced fields in Vietnam. About some 280 km Northwest of Hanoi, Mu Cang Chai is one of the most amazing landscapes of rice-terraced fields in Vietnam. Located about 1000 meters above sea level, Mu Cang Chai has a special topography with steep hills and deep valleys where the local residences such as Hmong, Thai, Dao have created the master-piece, Terraced Fields. They has cultivated about 500 hectares of rice terraces for centuries in La Pan Tan, Che Cu Nha and De Xu Phinh communes. The scenery is a big attraction to photographers and trekkers. How to get to Mu Cang Chai? 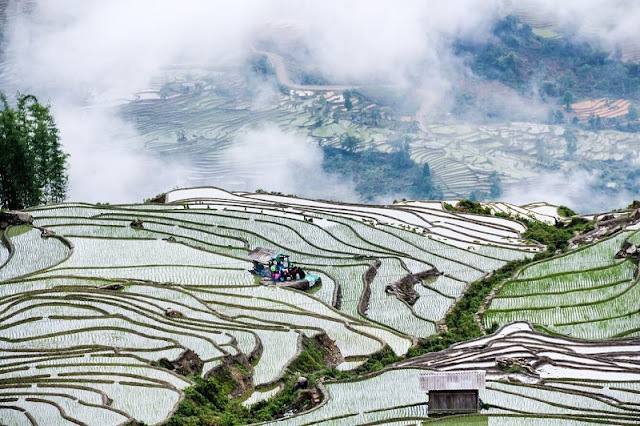 In fact, there are two routes to approach Mu Cang Chai : the first one is Hanoi to Mu Cang Chai directly on national road 32, the second choice is connecting your sapa excursion with a visit to Mu Cang Chai from Sapa. - From Hanoi to Mu Cang Chai, you can go straight to Mu Cang Chai by motorcycle or car. - Catch the bus Hanoi – Lai Chau which goes through Mu Cang Chai, then rent the motorbike to visit around the town area and Mu Cang Chai some neighboring villages to take pictures and admire the rice, the motorcycle rental you can contact the hotel always with you at the hostel so convenient. - Train from Hanoi to Yen Bai city and take bus to Mu Cang Chai town. However, the area itself is not much affected by tourism and therefore hotel services are limited. 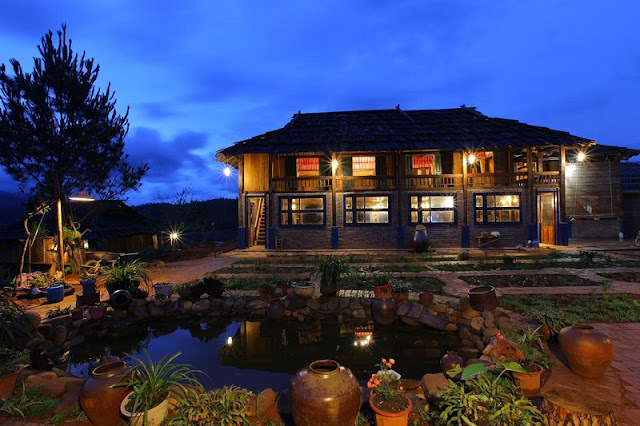 instead, The homestay services here bring more experience to you, you will have the rare opportunity to meet the indigenous ethnic minority groups in an area that most tourists never visit. As one of the lines winding and steep gorge ranks among the best Vietnam, Khau Pha Mountain pass is in the highest mountain in Mu Cang Chai area. Khau Pha Pass starting point is cut Highway 32 to Highway 279 consecutive seamlessly with grandchildren pass it forward and pass on the road behind Kim Walls 32. From the city of Yen Bai, vice along Highway 32 about 5 hours, through communal Tu Le, Khau Pha pass Mu Cang Chai district out between a plateaus surrounded by mountains identical messages. The winding stretches of road passes between the old forests are bold and pristine slopes terraced fields of H’mong, Thai. This is also the time when many tourists venture to conquer the scenic gorge. The jungle at Khau Pha preserved many rare animals and plants such as oil data, to her and all kinds of birds, other rare animals. Lim Mong Village in Mu Cang Chai district –is still hidden in the clouds. With difficulty of the road dangerous, Lim Mong is one of the destinations for travelers who love adventure and challenging. Famous for its beautiful terraced fields of heaven leaning fingerprint, La Pan Tan is not ashamed to be one of three localities of Mu Cang Chai district, Yen Bai province, terraces – art architecture epitomized creation of the Mong ethnic people living on this land by the Ministry of Culture, Sports and Tourism rated monuments scenic national level since late 2007. Tu Le is one village of Van Chan district Yen Bai province, about 265 km north of Ha Noi, in the North West Vietnam region. The Tu Le village is home to the HMong and Thai community. For the place being about 960 meters above sea level, the steep hills make it almost impossible to grow rice fields like those in the delta. Thus local residences grow their own rice on the terraced fields, for the purpose of preventing water from flowing downhill. These terraced fields lying among rugged green mountain valleys, under clear blue sky or a mysterious and script fog, bring to eyes an imposing scenery. The best time to visit Mu Cang Chai is from Mid-September to Mid-October during the season when rice fields are turning yellow and ready for harvest. This can be different each year (depending on weather), so be sure to check out first. BUT from May to Sep is also no less impressive when the rice fields are green. Mu Cang Chai has 2 pretty nice seasons which you can arrange to come; the other seasons to Mu Cang Chai have nothing special. Around mid-September to mid-October is the season of grain, all of rice terraces throughout Mu Cang Chai will be covered by bright yellow, the weather is nice and convenient to visit. Around May-June is the pouring season, when summer rains began pouring down the mountain, the water is led from the mountains into terraces. Water flooded into the fields to make arid become softer and swells to grow rice. This is also the time people go to the field to crops and prepare for a new season. 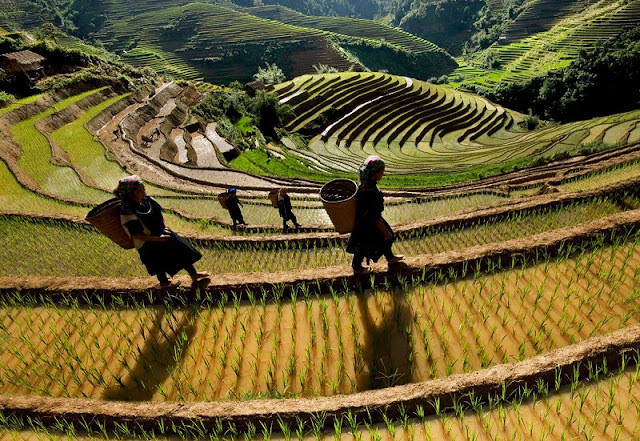 Therefore in the terraced in Northern Vietnam Mountains can only plant rice one time per year. This terraced water flashed in the sunset creates a beauty that many tourists to be surprised. 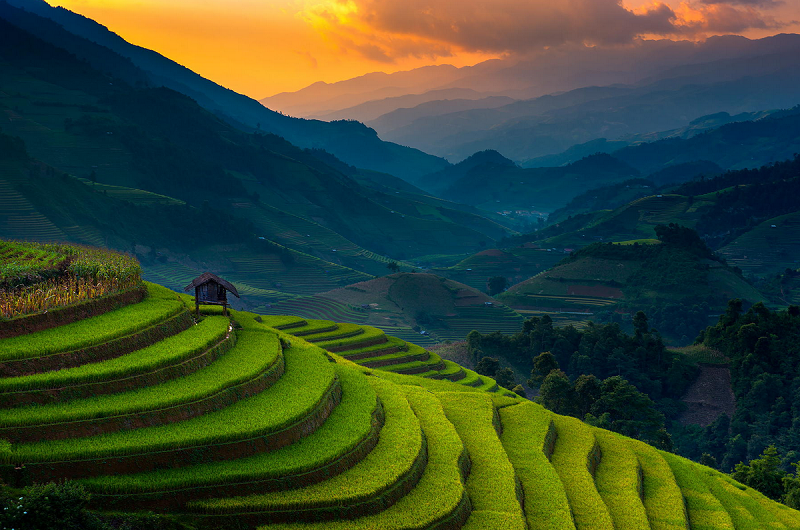 However, to capture beautiful pictures of Tu Le terrace rice field, you should be at the peak of Khau Pha pass from 7am to 9am (after this time it can still be sunny but will be blind, not illuminated). To do this you should sleep at Tu Le or go further 7km to Khau Pha Pass, above there is a restaurant - guest house with about 20 rooms for visitors. From here it only takes about 15 minutes is up to the top of the pass.